Hawaiian Wedding Cake has a couple of different forms. A lot of the time it starts with a yellow cake mix and ends with Cool Whip and that just isn’t my style. I wanted something with the flavor, a limited amount of the stuff I try to stay away from, and it had to be easy. I didn’t want to go through all the steps of making a homemade yellow cake, making pudding, etc. Again. It had to be easy. And good. I have never been to Hawaii. It is on my list of places to go but it is’t a priority – it’s beneath several others like Normandy, Alsace-Lorraine, Yorkshire, Scotland, Ireland, Greece, Venice, Rome, and Iceland. I seriously doubt that this cake is authentic Hawaiian fare – I imagine it was developed in the 1950s by one of the big convenience food corporations. I could be wrong. I had a couple of challenges. I mean besides the whole homemade and easy thing. But I REALLY wanted to make this cake and I usually don’t eat much – I knew I would only take a couple of bites. What to do? Well, I toasted the coconut and then gave it a couple of pulses in the food processor – just enough to break it up but not enough to make flour like stuff. You see, it seems that most people who dislike coconut don’t like the texture (which I have heard described as fingernail clippings). Break that up and you have coconut without the mouth-feel issues. I use Angel Flake brand coconut.. I always have, although I have tried other kinds I like this brand best. 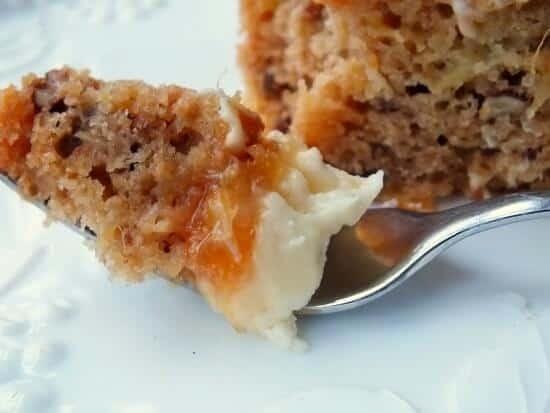 Use what you like but if you use the unsweetened coconut flakes you’ll want to add more sugar to the cake. I have had people ask what brands I use so I will start naming them in the recipes – but of course you can use what you like best. To make this simple I just added all of the ingredients into the cake. To keep it from being too heavy and dry I added a few splashes of Lopez Coco Loco to enhance the coconut flavor. I then spread a pineapple reduction over the top and then added a cream cheese frosting. Please don’t ask me about the calories. They’re high. I catch a lot of flack about my high calorie recipes. I love you guys but this is not a low cal recipe blog. Some of my recipes are low cal but that’s just coincidence. I have always held to the belief that you eat whatever you want in portions that your body needs. You will know you are overeating if you start gaining weight, it’s that simple. I can’t eat many calories at all – my 14 year old can eat endless calories. I have come to accept it. Saying that, this cake is not something you will be able to eat on a daily basis. It is much better the second day because the cake soaks up all of the liquid and the flavors meld and mature. 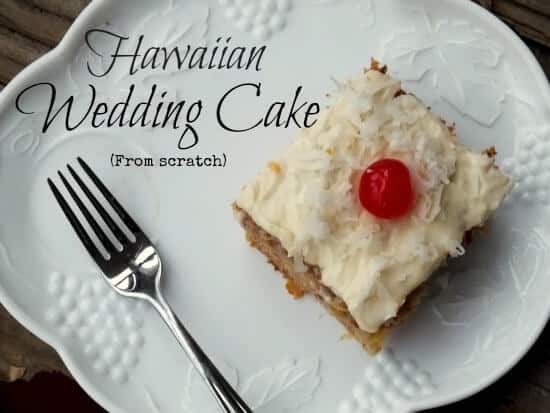 A moist, from scratch Hawaiian Wedding cake that is fast, easy, and full of flavor. Grease one 9 x 13 inch pan. Mix the dry ingredients together, don't forget to pulse the coconut in the food processor. Let cool for 5 minute and then poke the cake several times with a fork to allow the soaking syrup to be absorbed easily. Drizzle the soaking syrup over the cake - you may not need all of it depending on how moist the cake is. If you are using pineapple preserves spread them over the warm cake as soon as the soaking syrup has soaked into the cake. Mix the glaze ingredients in a heavy saucepan and cook, stirring often, until the mixture is reduced and it thickens. Mix the cream cheese and the butter in a mixer until well blended. Beat in the coconut syrup and vanilla. Whip until light and fluffy. This is a soft, creamy frosting. Wait until the cake has cooled completely and then spread the frosting over it. Refrigerate, tightly covered, overnight if possible. Garnish with maraschino cherries and more toasted coconut if desired. Because the syrup that soaks the cake keeps it moist. Do you think it would work to make into cupcakes? And to make ahead and freeze before frosting them? As I said… not everyone likes the flavor. If the texture is a problem then this solves it. Hopefully you won’t end up on a desert island anytime soon to test the theory.